This is a Wisconsin Bloody Mary. They always come with a short beer back (Pearl St. Pale Ale). My brother has returned to the Motherland with his beautiful family in tow, just in time to see the Packers win the Conference Championship. 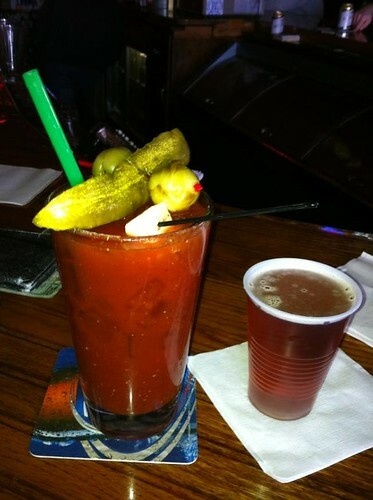 The only thing missing from that Wisco bloody mary is a beef stick stir straw. GO PACK GO! Oh Gaawd! If the pack wins I have to put with you twice in a year. The Giants and the Packers...keeerisedt. As an LA boy we have no damn team and I want to stay that way, because we get 5 games on the tube every sunday!